Sometimes focal images dictate what color paper you will use, but on this card I chose the paper first and then colored the focal image to go with the papers. I colored the little girl with my Copic markers. The stamp is a Technique Junkie August release stamp. It is called Keep Believing - http://techniquejunkies.com/keep-believing/. I sponged the sky in with light blue ink. 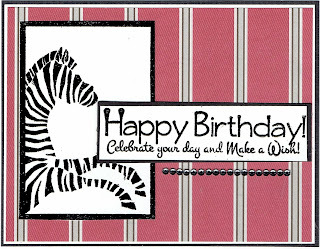 Ribbons and card stock layers complete the card. This Technique Junkie stamps Oceanside - http://techniquejunkies.com/oceanside/ reminds me of what I think the Maine coast might look like. Maine is one of the few states I have never been to so I don't really know. 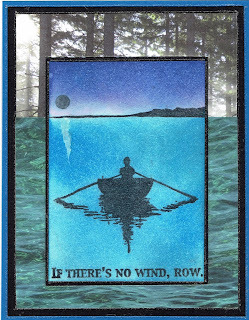 I colored the image with my Copic markers, sponged the sky, and stamped the verse from Road Trip - http://techniquejunkies.com/road-trip-set-of-6/, and of course mounted and layered the focal image on the base card. 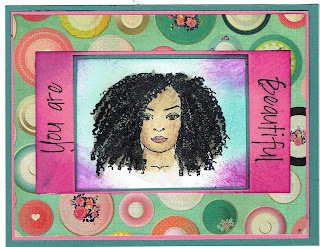 I used this lovely face from the Technique Junkie stamp set called Beautiful Faces - http://techniquejunkies.com/beautiful-faces/. The verse below is Kindness Matters - http://techniquejunkies.com/kindness-matters/. I colored the face with watercolor pencils. 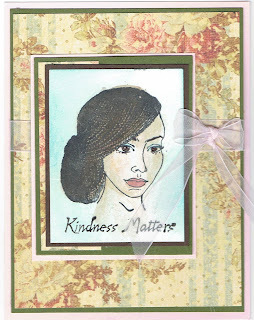 Then I layered the focal image on several layers of card stock and tied a ribbon around some of the larger layers before adhering it all on the pale pink base card. 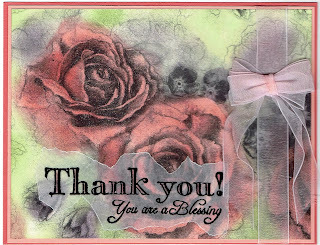 The stamps used on this card are Technique Junkie August release stamps. 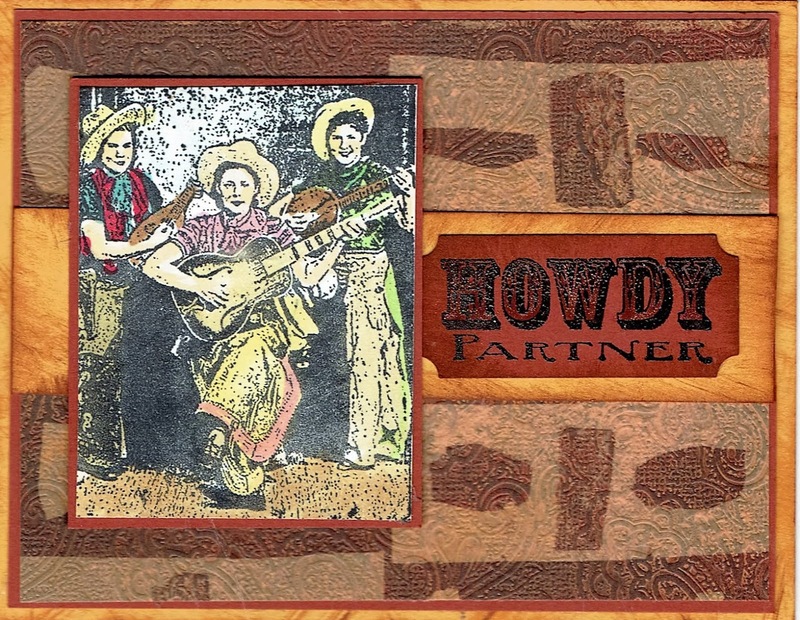 I used Three Amigas - http://techniquejunkies.com/three-amigas/ and Howdy Partner - http://techniquejunkies.com/howdy-partner/. They are fun stamps to use. I used my Copic markers to color the image. 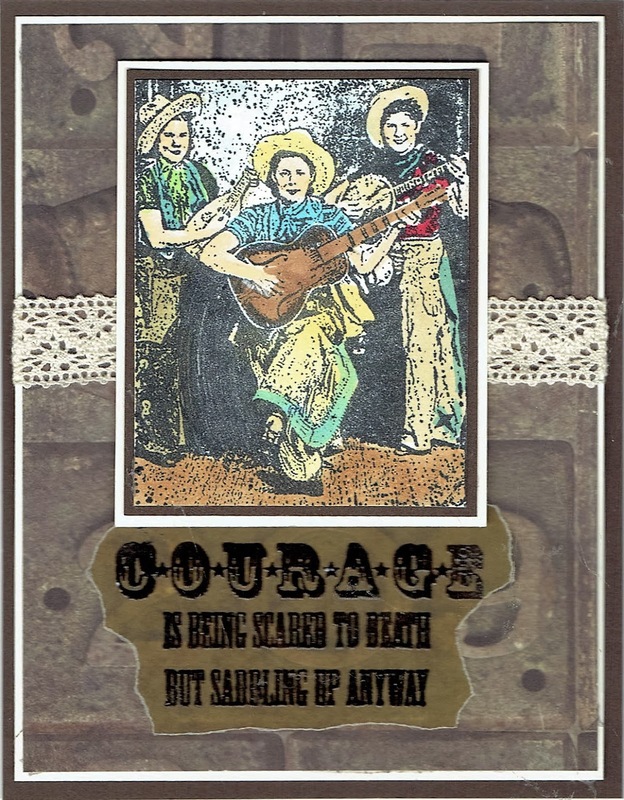 The words are stamps on rust card stock and the rust color shows in the blank spaces in the words. The words are heat embossed with detail black powder. 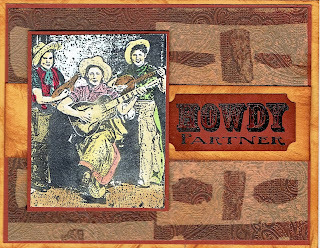 I searched for "Western" looking background paper in my stash. 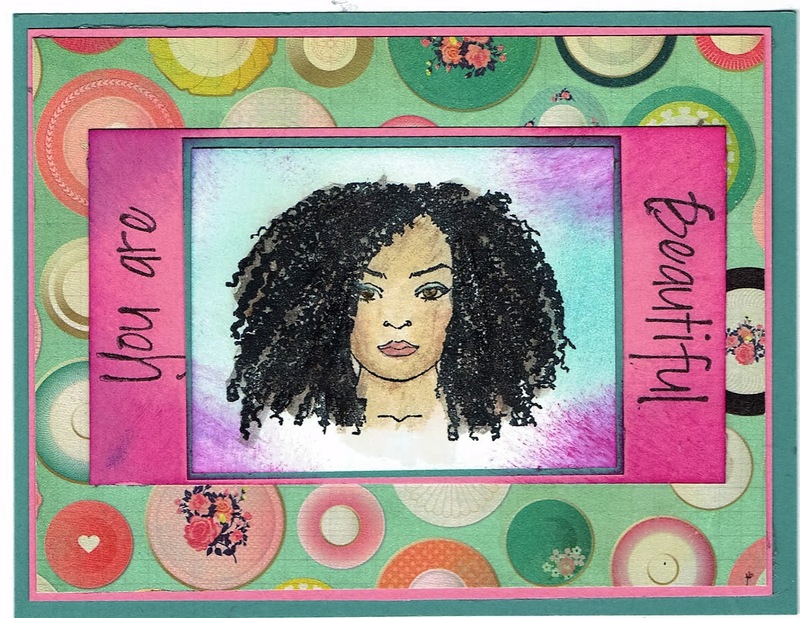 This is another easy card to card using dye based markers. I used the July Release stamp Something Will Grow - http://techniquejunkies.com/something-will-grow/, and another July Release stamp - Shine Like Sunbeams - http://techniquejunkies.com/shine-like-sunbeams/. I used a variety of colors of markers on the flowers - yellows, orange, and rust, and a green for the stem. 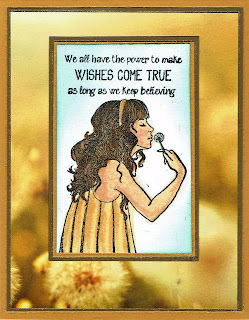 I used Memento black ink for the verse and then several layers of card stock to create thwe card. This is a ten minutes of less card -- which we all need at times! 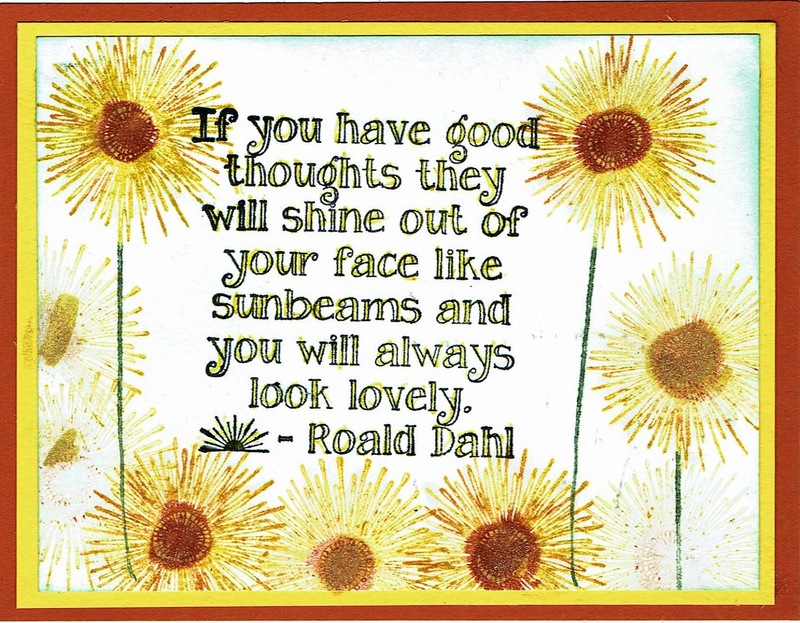 Have a wonderful sunshiney day -- and get inky! Row, and Row, and Row! I wrote about how meaningful this stamp is to me on my blog post on Saturday. If you didn't read that blog post I would like to invite you to read that post. I stamped this Technique Junkie stamp Row - http://techniquejunkies.com/row/ with black archival ink on white card stock. And then i trimmed the card stock to be sure that the horizon line extended the full width of the horizon on the top layer. Then I used round sponge applicators to add the colors for the water and for the night sky. I used a white pen to add the moon's reflection in the water - at least I hope that is what it looks like~ I layered it on black card stock. Then I cut 2 pieces of background papers from my stash -- water and trees -- to create an illusion of the continued background and horizon line. I adhered the focal image layers on the background papers so the horizon continued on the sides of the focal image. I layered all of the above on black card stock and then on the blue base card. 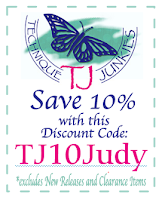 Today is the LAST DAY to get the 15% off of the Technique Junkie August Release stamps! Have you ordered yours yet? The focal image is an August Release stamp. Please remember that August Releases for Technique Junkie Stamps are on sale 15% off through August 8. You have a few more days to make your choices. The August Release stamp I used here is called Row - http://techniquejunkies.com/row/. I also used a stamp called Sea Waves - http://techniquejunkies.com/sea-waves/. First I created the Antique Glimmers background using various shades of blue, lavender, and purple inks. I masked off the sky before I stamped the Sea Waves stamp. Then I stamped the Row stamp with black Versafine pigment ink and heat embossed with detail black embossing powder. Now because I have this "thing" about horizon stamps not extending the whole width of the "horizon" on a card, I had to make it go the width of the horizon on this focal image. I used the fine tip end of the Versamark pen and with a ruler drew a line for the rest of the horizon on one side -- and heat embossed with detail black embossing powder, Then I repeated the same steps on the other side. Now the horizon extends the entire width of the horizon on the top layer. I added a few black pearls under the verse. This stamp is very meaningful to me. 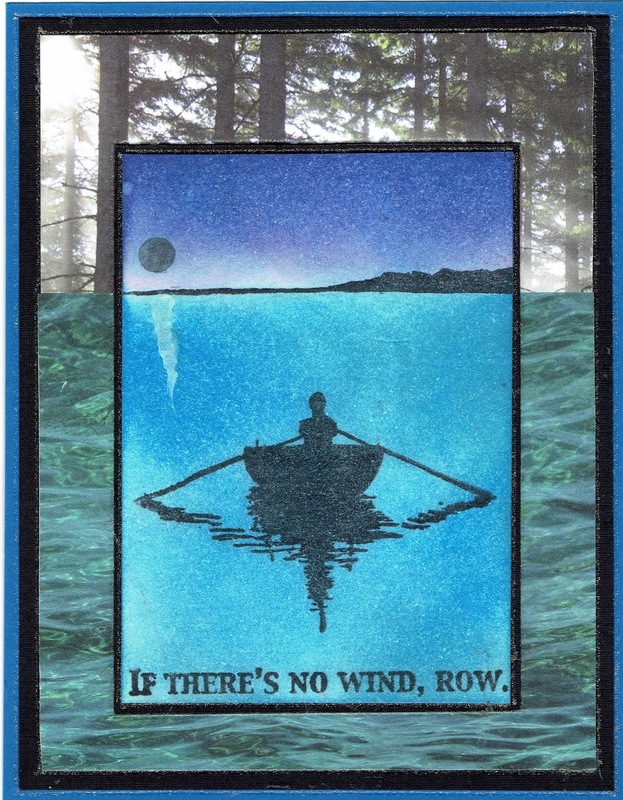 I didn't choose it -- Pat just sent it to me as one of the several stamps she sent to me from the August Technique Junkie Stamps Release.. After my husband died very suddenly in June 2015, I often felt like the wind was totally gone from my "sails." This went on for months. I am sure many of you have felt the same way after you have had some devastating loss in your life. But life goes on. Laundry has to be done, food has to be cooked, bills have to be paid, letters have to be written, and so on. 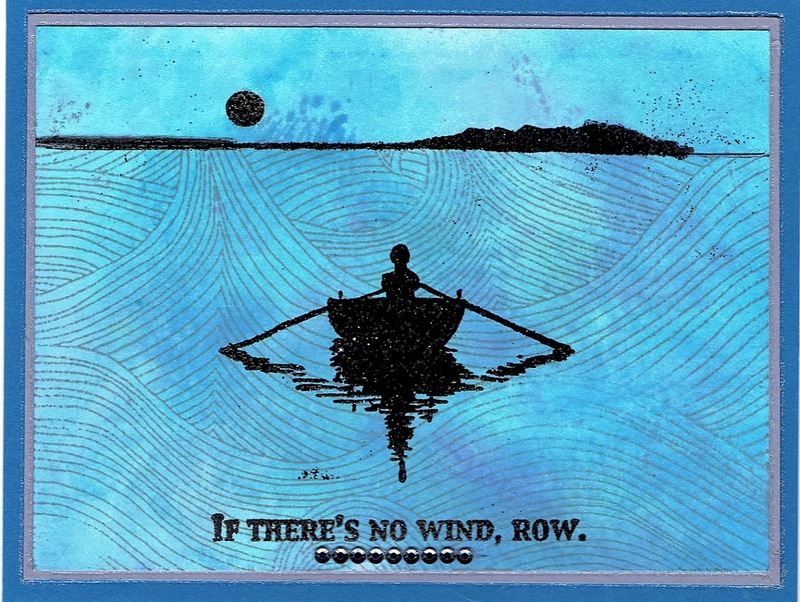 So when the wind stops -- we have to ROW! Life continues. Family continues. Jobs continues. Things go on. Just plain "stuff" continues to happen and we have to deal with it in some way. But this is what I can tell you - memories of love shared helps to sustain me. God's love always sustains me. The comfort of friends and other family members helps. 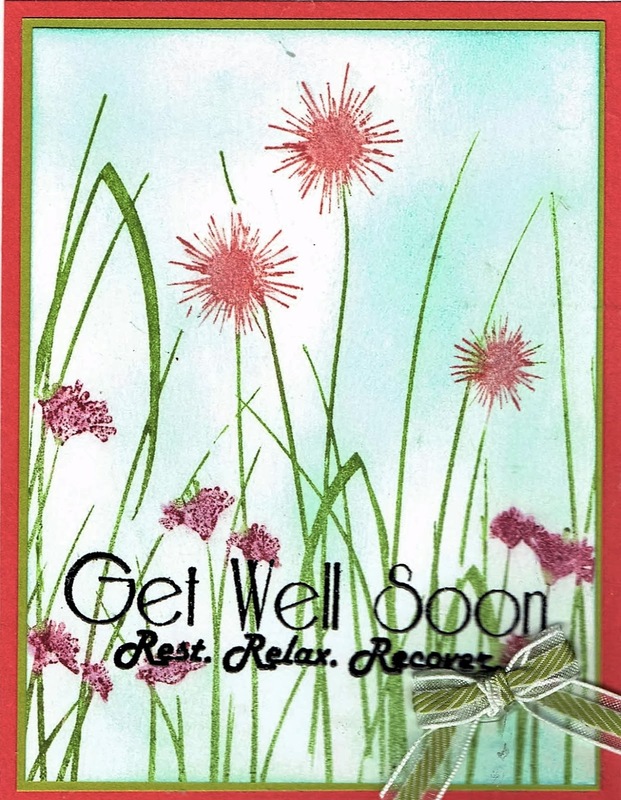 Receiving sympathy cards really does help. 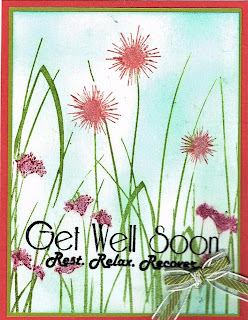 (So if you are tempted to not bother sending a sympathy card - just do it! It really does matter!) There were days when just doing the "normal" things was all I could do. There is a ton of stuff to do after a spouse dies - much more than when a parent dies. 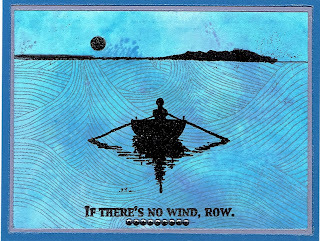 Just remember - when the changes of life tend to overwhelm you -- sometimes all we can do is ROW! Sometimes you need a quick card and this fits the bill! I used Technique Junkie stamps Growing Wild - http://techniquejunkies.com/growing-wild/ and a verse from Technique Junkie stamps - Grand Greetings - http://techniquejunkies.com/grand-greetings-set-of-5/ . Grand Greetings is an August release set and is on sale for 15% off through August 8. Use dye-based markers on the flowers and stem to add the color. The HUFF over your stamp - your breath will re-moisten the ink if it dried. Dye-based dry quickly even on rubber! Then stamp it on white card stock. Let it dry for a few seconds and sponge some blue ink to add sky. Rub an anti-static pillow over the paper. Stamp the verse with black pigment ink and cover with clear embossing powder. Heat set. 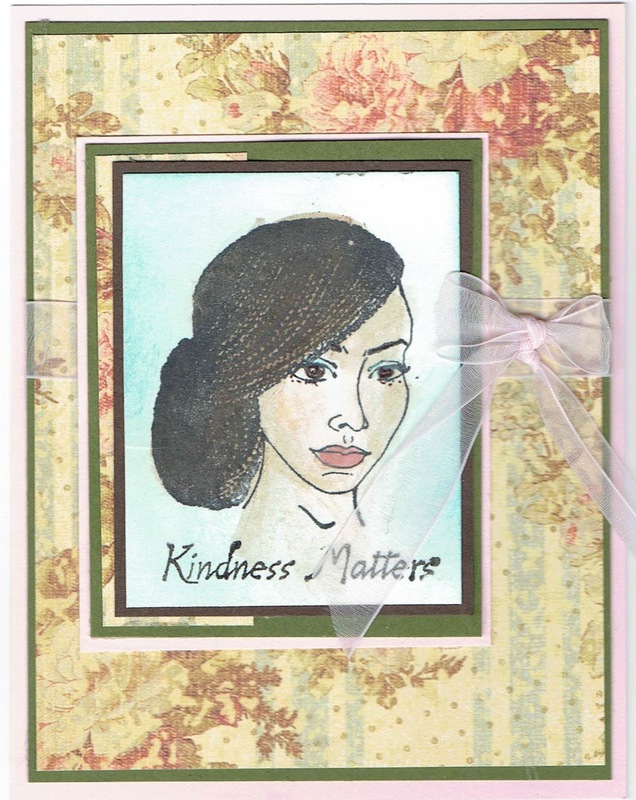 Tie a "fork-bow" adhere it with a glue dot, finish the card by layering to the base card, and you are done! 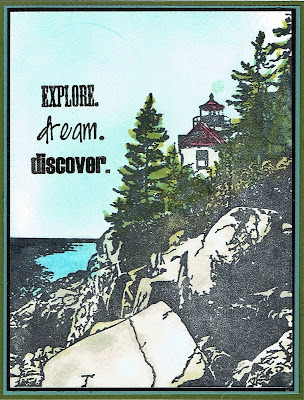 August Stamp Release -- How Fun! Today is August 1 -- the time for new and fun Technique Junkie Stamps! There are some really great stamps this month! Don't we always say that? 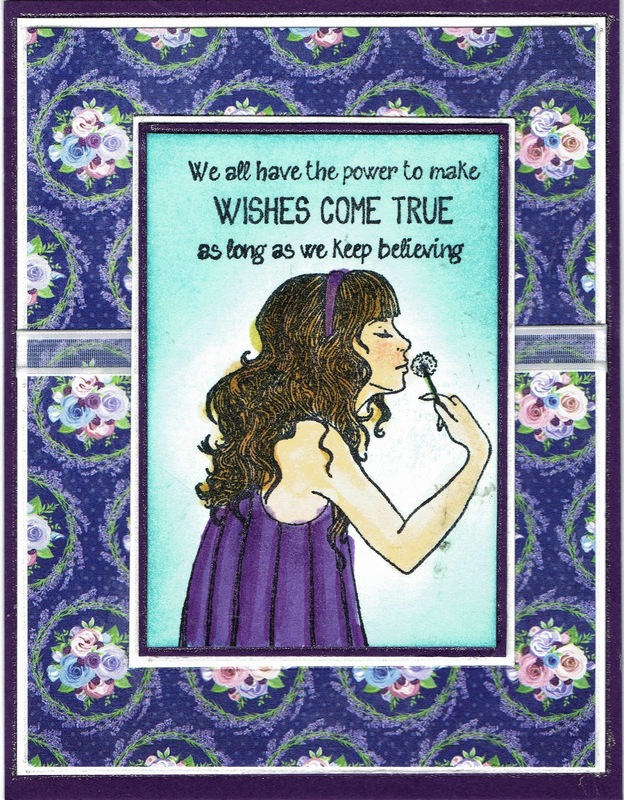 But this month Pat Huntoon has included a great set of verse stamps for a variety of occasions in the August release. All of the stamps or cards in this post are all from Technique Junkies! The start of the blog hop is right here: Design Team Blog: http://techniquejunkies.blogspot.com/2016/08/august-new-releases-with-15-discount.html. The next stop is Tonya Davidson: http://stampintonya.blogspot.com. Tonya will have something wonderful for you to see, I am sure! This first card reminds me of my oldest granddaughters (in one family) -- getting ready to blow the dandelion puff and make a bunch of wishes! 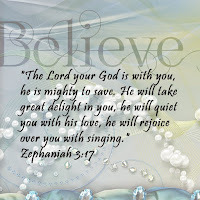 It is called Keep Believing - http://techniquejunkies.com/keep-believing/ . I colored in the image with Copic markers, and layered the focal image on this lovely designer paper from my stash. In fact I chose the colors for her dress from this paper! The sky is sponged with blue ink. My next card features one of the new verse stamps from the set called Grand Greetings - http://techniquejunkies.com/grand-greetings-set-of-5/ . There are five different greetings in all. I used a piece of designer paper with these lovely roses. The paper is in black and gray tones and the color of the flowers is sponged in. This next card use two Technique Junkie stamps - one new and one from a prior release. 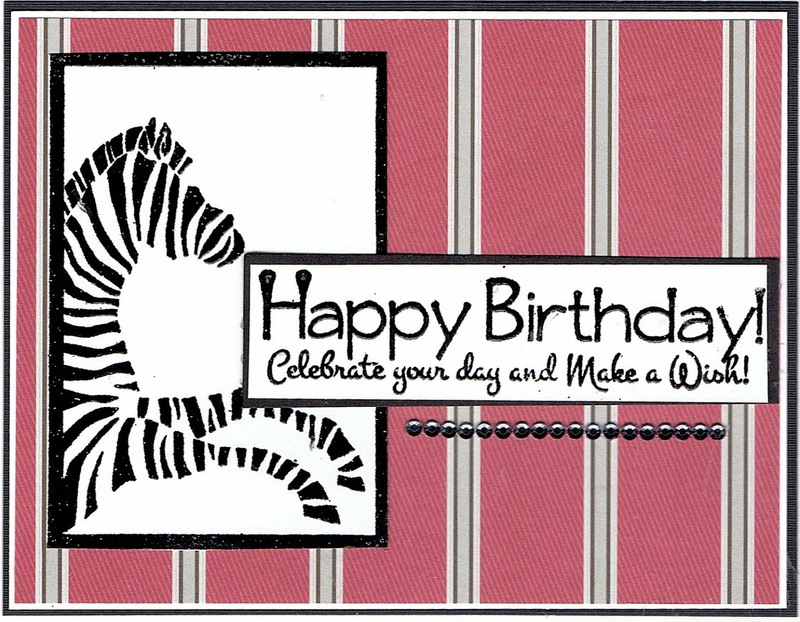 The Zebra ATC -- http://techniquejunkies.com/zebra-atc/was so easy to heat emboss with black embossing powder. The Happy birthday verse is also from Grand Greetings - http://techniquejunkies.com/grand-greetings-set-of-5/ . 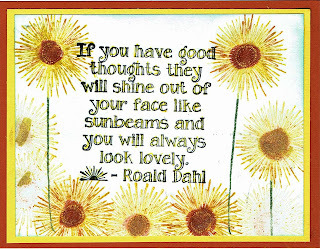 It makes a great saying fro a wonderful birthday card. I layered it on this masculine designer paper and added some pearls. This card features a very western stamp -- I can just see these ladies playing away at a square dance, can't you? I colored in the scene with my Copic markers. I used several layers to add dimension and visual interest. A strip of lace adds to the old fashioned feel of this card. The verse at the bottom is heat embossed on vellum and adhered with adhesive from my Xyron machine. The ladies are one stamp called Three Amigas - http://techniquejunkies.com/three-amigas/ . And the verse is called Courage - http://techniquejunkies.com/courage/ . And now you have seen my four samples from the Technique Junkie August stamp release. Quite the variety isn't it? Here is the entire blog hop list. If you get lost you can come back here to see where to go next. Judy Jackson: http://judysstampart.blogspot.com/2016/08/august-stamp-release-how-fun.html - You are here! Tonya Davidson: http://stampintonya.blogspot.com/2016/08/cool-cat.html - Go here next! I hope you join us on this hop and go from blog to blog to what lovely, interesting, and fun things the rest of the Technique Junkie Design Team has created for your eye candy today! And remember all August Release stamps are on sale for 15% off through August 8!